I typed the title ‘Going Potty’, then decided that sounded like a story about toilet training children. This is not a story about toilet training children. It’s a bit too soon for that yet. No, this is a story about painting pots. I had three Berberis thunbergii ‘Helmond Pillar’ shrubs that desperately need to get out of their pots, and I decided they would look great, and were just right in number, for a site along the side of the carport. Big pots (or planters) can be expensive. Since I like to keep costs down I had trouble finding some in a colour and style that I liked. 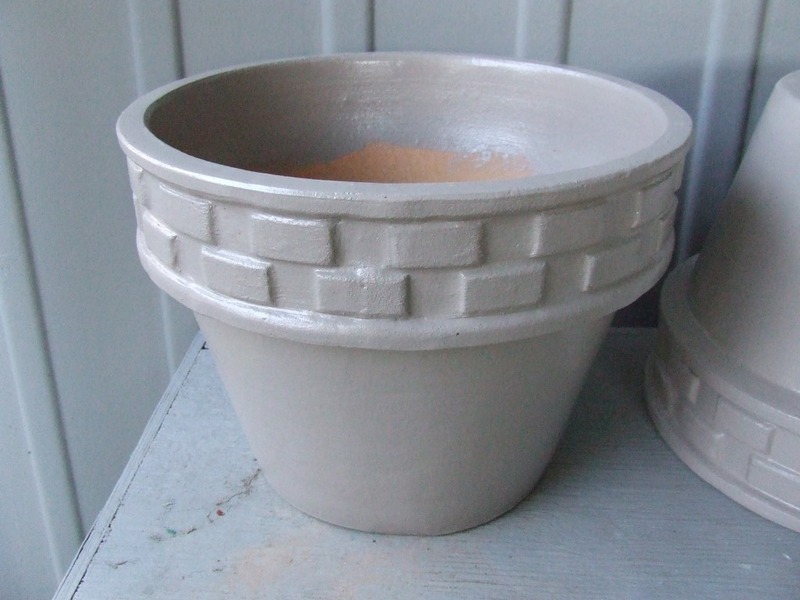 The decision came down to plastic-type pots in a beige colour I liked or terracotta pots with a nice brick-like edging that I could paint, which were on special at The Warehouse. I opted for the more creative (time-consuming) terracotta option. This necessitated a trip to Bunnings (how sad.. cough) to find some appropriate paint. I hadn’t painted pots before or even researched it (naughty! ), so I figured paving paint would be a good option. First, I cleaned the pots with water and a pot scrubber to get rid of any dirt or loose residue. Once dry, I painted around the rims, making sure to go down inside the pots a bit so no terracotta will show when the pots are filled. After a day or two I turned the pots upside-down and painted the rest of them, overlapping the paint a little on the bottom of the pots too.